We practice what we Preach and deliver Strategic Solutions. Methodology with core competency and knowledge always work and it gives a substantial success ratio. We have worked hard to widen the processes and methodology we make best use of. We understand that by following a well-defined methodology we can provide our clients excellent solutions varying from creative website designs to extremely safe and easy to use ecommerce solutions. When we talk about our methodology, it is purely based on client specific needs and requirements; we take up wide-ranging development methodologies and practices. With the help of this method we do concept building and prototyping and make it easy to understand the requirements in a better way. After understanding client's requirements we advise and provide costs on the finest solution possible for Enterprise Application development, ecommerce & software development,. We plan, design, develop, test and deploy the solutions adhering to a strict quality assurance strategy and delivery schedules. Our client is an integral part of our development cycle and we keep our client informed about the advancement of the project. After the deployment of the project we follow up on our solution by offering training, maintenance and ongoing support. 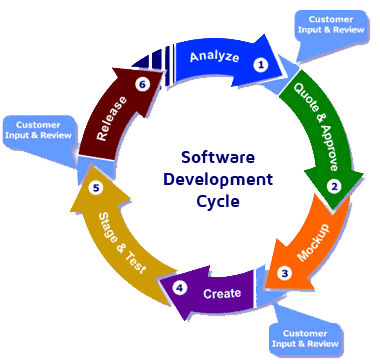 At Quadruple, we have developed a unique 6 step Software Development Life Cycle (SDLC) methodology to help businesses profit from our services. It has a proven track record of successful project competitions.